"The City That Works For You"
In the mid 18th century, Mdewakanton Dakota tribes lived in the vicinity of New Brighton's marshy lakes, harvesting wild rice. The Dakota eventually settled a village near Long Lake at Rice Creek and a smaller encampment just east of Silver Lake Road on 3rd Street NW. Immigrants from Britain and France settled a small village in 1858 which included a general store, school and mission church. As railroads were established in the area, millers in Minneapolis formed the Minneapolis Stockyards and Packing Company in 1888. The company supplied home, agriculture, and business needs. The venture included Minneapolis figures such as streetcar magnate Thomas Lowry, flour millers John Sargent Pillsbury, Senator William D. Washburn, ex-Minneapolis Mayor W.H. Eustis, and industrialist W.H. Dunwoody. As the village grew in prominence, it was incorporated on January 20, 1891. The city was given the name Brighton after Brighton, Massachusetts. The founding population was primarily English-American. Each August, a city festival celebrates this heritage, called the Stockyard Days and is held at Long Lake Park. As the streetcar system expanded in the early 20th century, immigrant and first-generation groups from Eastern Europe and Germany began moving outwards from Northeast Minneapolis. New Brighton and St. Anthony residents also continue to celebrate this ethnic heritage with an annual Polka Dance Party which began in 1892. In the 1920s, a local farmer said he heard a rumor that gold bars were buried along the eastern shore of Long Lake by bootleggers. This rumor spread and in the following years launched a mini "gold rush" along Long Lake to find the treasure. According to the United States Census Bureau, the city has a total area of 7.06 square miles (18.29 km2), of which 6.46 square miles (16.73 km2) is land and 0.60 square miles (1.55 km2) is water. Rice Creek flows through the northern part of the city. New Brighton is located at the intersection of Interstate Highways 35W and 694. It is geographically incongruent. From north to south it is not even, and east to west it is even in only a few places. A piece of the city sits on the east side of Interstate 35W isolated from the rest of the city. Nearby places include Arden Hills, Shoreview, Roseville, Saint Anthony Village, Columbia Heights, Fridley, Mounds View, and Minneapolis. New Brighton has several parks, including Richard J. Hansen Park, Freedom Park, Sunny Square Park, Creek View Park, Meadow Wood Park, Hidden Oaks Park, Silver Oaks Park, Innsbruck Park, Veterans Park, Vermont Park, and Long Lake Regional Park. Bur oak trees over 200 years old and native prairie grass such as Big Bluestem can be found in Long Lake Park. Remnants of old farmsteads can be found at Long Lake Park as well (look for lilacs and rose bushes in the middle of the woods). New Brighton is almost exactly halfway between the equator and the north pole, with a latitude of 45 degrees. New Brighton is part of east–central Minnesota's glacial plain sandpile, which was flattened by glaciers during the most recent glacial advance. During the last glacial period, massive ice sheets at least 0.62 miles (1 km) thick ravaged the landscape of the town and sculpted its current terrain which can be easily seen in Long Lake Regional Park within the city. The Wisconsin glaciation left 12,000 years ago. These glaciers covered all of Minnesota except the far southeast, an area characterized by steep hills and streams that cut into the bedrock. Since the New Brighton landscape is still recovering from the weight of the glaciers and going through post-glacial rebound and the turmoil this created, the landscape is poorly drained created the numerous lakes and rivers found in the city. Long Lake itself is the remnants of the glaciers, as it was a chunk of ice that was left behind, melted, and created the lake in the hole it occupied. As of the census of 2010, there were 21,456 people, 8,915 households, and 5,731 families residing in the city. The population density was 3,321.4 inhabitants per square mile (1,282.4/km2). There were 9,479 housing units at an average density of 1,467.3 per square mile (566.5/km2). The racial makeup of the city was 84.2% White, 4.1% African American, 1.4% Native American, 4.8% Asian, 2.2% from other races, and 2.1% from two or more races. Hispanic or Latino of any race were 4.2% of the population. There were 8,915 households of which 28.4% had children under the age of 18 living with them, 49.3% were married couples living together, 10.8% had a female householder with no husband present, 4.2% had a male householder with no wife present, and 35.7% were non-families. 28.8% of all households were made up of individuals and 10.9% had someone living alone who was 65 years of age or older. The average household size was 2.35 and the average family size was 2.89. The median age in the city was 40.7 years. 21.1% of residents were under the age of 18; 9.4% were between the ages of 18 and 24; 24.5% were from 25 to 44; 27.2% were from 45 to 64; and 17.7% were 65 years of age or older. The gender makeup of the city was 48.3% male and 51.7% female. As of the census of 2000, there were 22,206 people, 9,013 households, and 5,903 families residing in the city. The population density was 3,343.9 people per square mile (1,291.2/km²). There were 9,121 housing units at an average density of 1,373.5 per square mile (530.4/km²). The racial makeup of the city was 88.19% White, 3.02% African American, 2.62% Native American, 3.38% Asian, 0.06% Pacific Islander, 0.84% from other races, and 2.20% from two or more races. Hispanic or Latino of any race were 1.77% of the population. There were 9,013 households out of which 28.8% had children under the age of 18 living with them, 52.4% were married couples living together, 10.0% had a female householder with no husband present, and 34.5% were non-families. 26.1% of all households were made up of individuals and 7.8% had someone living alone who was 65 years of age or older. The average household size was 2.40 and the average family size was 2.91. In the city the population was spread out with 22.2% under the age of 18, 11.3% from 18 to 24, 28.3% from 25 to 44, 25.6% from 45 to 64, and 12.6% who were 65 years of age or older. The median age was 37 years. For every 100 females there were 94.8 males. For every 100 females age 18 and over, there were 91.4 males. The median income for a household in the city was $52,856, and the median income for a family was $68,724. Males had a median income of $45,291 versus $32,021 for females. The per capita income for the city was $27,574. About 3.3% of families and 4.7% of the population were below the poverty line, including 5.5% of those under age 18 and 3.9% of those age 65 or over. New Brighton has four public schools, several lakes (Long Lake and Silver Lake, Pike Lake, among others), one seminary, and many churches and places of worship (Lutheran, Catholic, LDS, Jehovah's Witness, Apostolic, Baptist, United Church of Christ, Korean Methodist, Christian Science, Non-denominational, and others). The town is mostly residential and split into different sections of residence. Sections of apartments, as well as Wexford Heights, an upper-middle-class housing development, dominate the southern end of the town. The apartments are often referred to collectively as "Polynesian," the name of one apartment complex in the center of the area. "Downtown New Brighton" is distinguishable from other areas of the town because of the old-fashioned street lights set approximately twenty feet (6.1 m) apart down the entire road. Northern New Brighton has a small commercial area and is mostly middle-class homes built from the 70s to 90s. New Brighton also has a significant office of IT software company Ivanti. The New Brighton Department of Public Safety provides police, fire, and emergency management services to the City. The Department is led by Public Safety Director Bob Jacobson, Deputy Director Tony Paetznick, and Deputy Director Dan Olson. The Police Division consists of 28 full-time police officers, 20 reserve police officers, three public safety officers, and three civilian support personnel. The Police Division responds to over 11,000 calls for service annually. Officer assignments include uniformed patrol, criminal investigations, crime prevention, and school resources officers (SRO) at Irondale High School and Highview Middle School. The Fire Division consists of 38 paid-on-call firefighters who respond to over 400 calls for service per year, a full-time fire marshal, and one civilian support staff. Several members of the Police Division also serve in the Fire Division. The Department also includes a Volunteers in Public Safety (VIPS) civilian volunteer team and a Community Emergency Response Team (CERT), both part of the Citizen Corps organization. The agency is headquartered in the state-of-the-art New Brighton Public Safety Center, which opened in 2003, and maintains a modern fleet of police and fire vehicles. The influence of the Department of Public Safety extends far beyond New Brighton's 7.1 square miles (18 km2). The agency is well known regionally and nationally for its successful community policing efforts and is a leading organization in Minnesota's crime prevention and emergency management communities. In 2004 New Brighton was awarded the prestigious International Community Policing Award by the International Association of Chiefs of Police (IACP), given to just five cities in the world. The following year the National League of Cities bestowed its James C. Howland Award for community enrichment on New Brighton for its groundbreaking community policing partnership, which substantially reduced crime at the Polynesian Village apartment complex. In 2005 New Brighton was named First Place in the nation for participation in National Night Out (population category four: 15,000-49,999) by the National Association of Town Watch. Over 10,000 cities compete annually for the award. New Brighton's first-place finish followed years of work by the Police Division's Crime Prevention Unit to build a strong network of neighborhood crime watch captains and agency volunteers and to promote participation in National Night Out by citizens from all segments of the community. Four public schools are located in New Brighton: Bel Air Elementary School, Sunnyside Elementary, Highview Middle School, and Irondale High School; additionally, until 2005, when it was converted into a community education center, there was a fifth public school located in New Brighton: Pike Lake Elementary School, now known as Pike Lake Education Center. All of these schools are part of the Mounds View Public Schools (District 621). Bel Air Elementary is located on 5th Street NW, and serves 672 K–5 students from New Brighton. Sunnyside Elementary is located on County Road H, and serves 518 K–5 students from New Brighton and Mounds View. Highview Middle School is located on 7th Street NW, and serves 814 6–8 grade students from New Brighton, Arden Hills, and Roseville. Irondale High School is located on Long Lake Road, and serves 1,577 9–12 grade students from New Brighton, Mounds View, and Shoreview. Nearby private high schools attended by residents include Totino-Grace in Fridley, Minnehaha Academy in Minneapolis, or Breck School in Golden Valley. High school students in a portion of eastern New Brighton attend nearby Mounds View High School. Students from southern New Brighton formerly attended Mounds View, but the district lines were redrawn to send more students to Irondale to alleviate overcrowding. A small fraction of New Brighton students attend Wilshire Park Elementary and Saint Anthony Village Middle and High Schools in nearby Saint Anthony Village, as part of New Brighton is served by ISD 282. Irondale High School was listed as one of the top 500 schools in the country by Newsweek in 2000 and 2003, although it had a notoriously bad football team in the late 1990s. They won only 4 games during all of the 1996–1999 seasons. Although, in 2007 Irondale had its best season for football, winning 8 games and defeating Totino-Grace (the current state champions) although this great season was a nice change of pace for the Irondale community, they were bounced from the playoffs in their first game losing to White Bear Lake. However, the school has one of the most renowned marching bands in the state of Minnesota/USA. After bringing home top honors during the 1990s at many large state competitions, the Marching Knights are nationally recognized as being a high-ranking, proficient marching band. They often make finals at regional Bands of America competitions. B.O.A. is the largest national contest for many marching bands across America. The band placed second at the 2006 Youth in Music Band Championships held at the Hubert H. Humphrey Metrodome. Irondale also has the largest Drama program in the Mounds View School District. Four productions are put on yearly, as well as a competition one act play. This high school was also mentioned in the movie In the Line of Fire starring Clint Eastwood. The assassin Mitch Leary tells a bank teller he grew up in Minneapolis and went to New Brighton high school. New Brighton is also home to United Theological Seminary of the Twin Cities, an ecumenical graduate school of the United Church of Christ. The seminary is multi-denominational, educating students from over 20 different denominations as well as other religious communities. The school offers degrees in Master of Arts, Master of Divinity, Master of Religious Leadership, and Doctorate of Ministry. Groundwater is pumped from 12 deep wells, ranging from 300 to 1,000 feet (300 m) deep. The groundwater is located in three aquifers: Prairie du Chien, Jordan and Mt. Simon/Hinckley. New Brighton’s water is classified as very hard with 17 to 20 grains per gallon (290 to 340 g/m³). Water hardness is due principally to calcium and magnesium and water is generally harder in areas where calcium and magnesium rich limestone rocks are present. New Brighton pumps some of its water from aquifers in dolomite/limestone rock formation. 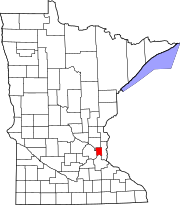 Groundwater pollution was discovered in the late 1980s in New Brighton along with Arden Hills and St. Anthony, which came from chemical dumping at the nearby Twin Cities Army Ammunition Plant. Following litigation settlement, the U.S. Army provided New Brighton and the surrounding northern suburbs with clean water supplies and new systems to monitor and filter pollution. Additional contamination was discovered in 2015. The city has switched wells until the contaminants can be cleaned. In the 1993 film In the Line of Fire, assassin-in-training Mitch Leary (John Malkovich) pretends to be from Minneapolis. He is unprepared when asked by a Minneapolitan which high school he attended. Leary answers "New Brighton High School". The questioner replies that there is no New Brighton High School, but she can't remember the name of the high school in New Brighton. This exchange proves to be important to the plot. ^ "New Brighton City History". City of New Brighton. 2006. ^ Upham, Warren (1920). Minnesota Geographic Names: Their Origin and Historic Significance. Minnesota Historical Society. p. 437. ^ King's Twin Cities Metro Street Atlas '04. Minneapolis: The Lawrence Group. 2004. ISBN 1-58301-215-X. ^ a b Ojakangas, Richard W.; Charles L. Matsch (1982). Minnesota's Geology. Illus. Dan Breedy. Minneapolis, Minnesota: University of Minnesota Press. ISBN 0-8166-0953-5. ^ United States Census Bureau. "Census of Population and Housing". Retrieved November 6, 2014. ^ Turner, Brent (2006-10-29). "And the Winner Is..." Youth in Music. Archived from the original on 2006-11-28. Retrieved 2007-10-11. ^ City of New Brighton, Minnesota (USA) (April 2015). "New Brighton Drinking Water Updates". City of New Brighton.